79. The tyranny of procrastination. 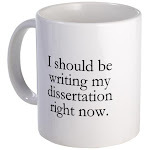 The problem of procrastination in graduate school is, in part, a problem of perception. When you could be working anytime and all the time (see Reason 62), it can feel like you’re procrastinating when you’re doing anything else. Reading for pleasure, spending time with family and friends, cooking, exercising, and even sleeping (see Reason 78) are hard to enjoy when you’re saddled with the feeling that you should be working instead. Of course, if what you’re doing has the slightest appearance of procrastination to you, it may well look that way to someone else. In the event that your department can only fund half of its graduate students next year (see Reason 17), you don't want to be the one that your departmental chair sees sauntering into a Tuesday matinee as she happens to drive by the movie theater. 78. It takes a toll on your health.